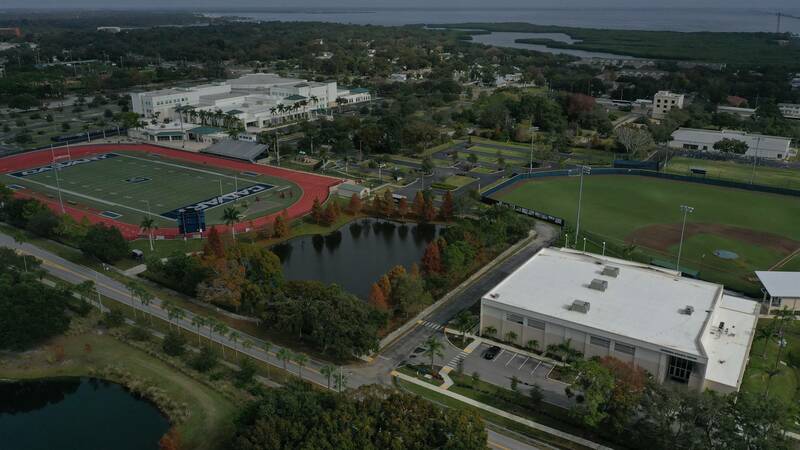 In 2011, Calvary Christian High School was blessed with a donation for the completion of a Sports Complex named, The Rock. The name for the stadium was taken from Matthew 16:13-18, When Jesus came to the region of Caesarea Philippi, he asked his disciples, "Who do people say the Son of Man is? "They replied, "Some say John the Baptist; others say Elijah; and still others, Jeremiah or one of the prophets." "But what about you?" he asked. "Who do you say I am? "Simon Peter answered, "You are the Christ, the Son of the living God." Jesus replied, "Blessed are you, Simon son of Jonah, for this was not revealed to you by man, but by my Father in heaven. And I tell you that you are Peter, and on this rock I will build my church, and the gates of Hades will not overcome it. We desire this facility to be a venue where many people come to know Jesus Christ. In 2012, Calvary received a generous donation for the construction of a baseball field to provide the same quality facility as the Sports Complex. Construction began in August of 2012 and the facility was ready for the opening game of the 2013 season. The facility was named, Victory Field after 1 Corinthians 15:57, "But thanks be unto God! He gives us the Victory through our Lord Jesus Christ." We are extremenly grateful for the wonderful facilities God has provided our school so our students have a great experience through athletics. May God receive all the Glory!